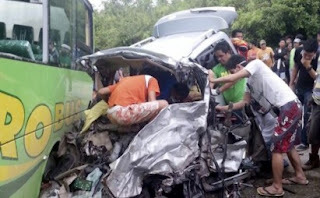 A shocking accident rocked the quiet city of Puerto Princesa when a passenger bus and a Toyota Innova collided head-on at around 3 p.m. yesterday in Baranggay Sta. Lucia. The fatalities were identified as Oscar Ocampo, Leonardo Gallenito (driver), Bryan Almadrones, Ariel Rocamora (son of Agustin Rocamora, provincial administrator), Magnolia Martin, Cathlyn Payuyo (daughter of APEC party-list Representative Ponciano Payuyo), and a woman named Alma whose last name has yet to be ascertained. It was reported that the van was heading to Luzviminda town while the RORO line was on its way to Puerto Princesa from Rio Tuba. Some of the passengers on the bus were hurt but no one’s in critical condition. The driver of the van unfortunately including its six passengers were the ones who perished from the crash. I don’t know personally those who died in the crash but some of their friends who happen to be my friends, are now in their troubled times. My heart goes out to the bereaved families. May their soul rest in peace.